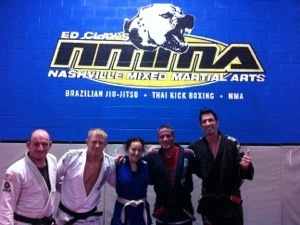 Brazilian Jiu Jitsu is known as the “gentle art”. It is a form of fighting that emphasizes usage of joint locks and choke holds – there is no striking used in Jiu Jitsu sparring sessions. 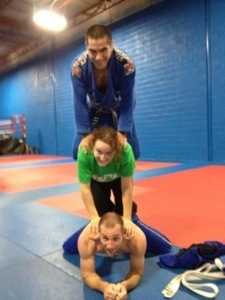 BJJ is awesome for us little people, because of the usage is on angles and leverage. When proper technique is used, the playing field is leveled – even when facing a much larger opponent! I’m about 4’3 give or take a few, and I compete at feather weight (129lbs). I had a large, fairly drunk gentleman once who would not leave me alone – so he was put into a standing shoulder lock and walked over to security. No harm done (except to his ego!) – and this was after just a few months of training! In competition I fight against other girls who are my own size – it’s more of a sport application. The playing field is leveled as much as possible in a skill vs. skill, timed match. When I’m training at home, I always take time to practice it as a self defense against a viable attacker. I have learned how to position my body to protect my most vulnerable areas, keep calm, and wait for my opportunity to escape sans injury. Physical Chess – every move I make, my opponent has at least two options to counter with. There are at least two responses I can make to his counter… And so on. The person able to stay ahead of the game, wins. Partner Break Dance – quite a few of the guys I train with actually can bust out a windmill or two before class. When you’re rolling around on the ground, sometimes it really does look like break dancing with another person!